Here’s part three of three, with suggestions geared to residents looking to entertain visiting friends or family. We all have friends and family come to visit us. 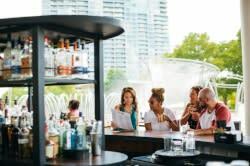 And inevitably we all get asked the question, “So, what are we going to do while in town?” Check out the following ideas for a fun Columbus experience and give your visitors a better sense of why you call Columbus home. Where to Eat My favorite place to take family and friends to eat in Columbus is Tasi Cafe . Located just behind High Street, Tasi’s offers freshly prepared comfort food with a unique flair. The casual atmosphere makes it a favorite of locals, and the menu offers breakfast, lunch and dinner options. The Refectory is an AAA Four Diamond award winner, offering contemporary American cuisine and classic French cuisine. The restaurant&apos;s location is unique - it&apos;s inside of an old church, and the atmosphere has a rustic feel. Also, they have an amazing wine cellar with over 700 selections. No matter what your visitors&apos; tastes, they are sure to find something they like at the North Market . Central Ohio’s historic public market since 1876 and located between the Short North and Arena District, it features fresh and prepared foods, and authentic ethnic cuisine. What to Do/See Columbus is well known for its distinct cultural, arts and entertainment districts. Although we have many to choose from, two that are close to the heart of downtown and have gained national acclaim are the Short North Arts District and German Village . Both are explorable by foot and offer distinctive experiences. Visiting friends will enjoy exploring the Short North&apos;s eclectic galleries and shops containing local fine art, antiques, clothing, furniture, books, jewelry, candles and gourmet food. And since the Short North is home to many of Columbus’ original eateries with varied cuisines and price ranges to suit just about everyone, it also offers unique dining options. Visitors to German Village are often struck by the architecture of impeccably kept homes, brick streets, lovely gardens and parks. I&apos;d recommend catching up with friends during a tour of the Village on foot with a map from the visitor center located at the German Village Society Meeting Haus (588 S. Third St., open Mon.-Sat.). You can literally eat, drink and shop your way through terrific delis, coffee shops, pubs, bookstores, art galleries and craft stores. Plus, you&apos;ll find some of the finest dining in the city here. Another thing to share with visiting friends and family is the Columbus arts scene. Try a visit to the Columbus Museum of Art , the Wexner Center for the Arts or one of the many independent galleries in the aforementioned Short North Arts District. For performing arts, check out CAPA &apos;s lineup. If shopping is what your guests are after, I&apos;d suggest Easton Town Center and its pedestrian-friendly streetscapes, open-air gathering spaces, fountains, children’s parks, and more than 170 retail, entertainment and dining tenants all in an indoor/outdoor setting. Columbus in Only 2 Hours Last, if you really want to see a whole lot of downtown, the Arena District and the Short North Arts District in a quick and unique way, try SegAway Tours of Columbus . You can explore downtown on a Segway, while learning about the historical buildings, attractions and more along the way. The tours last two hours and are just as much fun as they are informative (check out the Columbus Segway experience I had here ).